With 2,000 square miles of space in a subtropical wonderland, Miami is a metropolitan paradise of gorgeous beaches, gorgeous people, and iconic culture, blending Latin beats, Caribbean flavours, and red-blooded Americana. This spirited combination makes Miami a great place to explore, and there are numerous ways to do it. The Magic City has many neighbourhoods accessible by public transportation, and plenty of places to hike, bike, and boat. So, what are the best ways to get around Miami? It really depends on your budget and the level of independence and convenience you require. 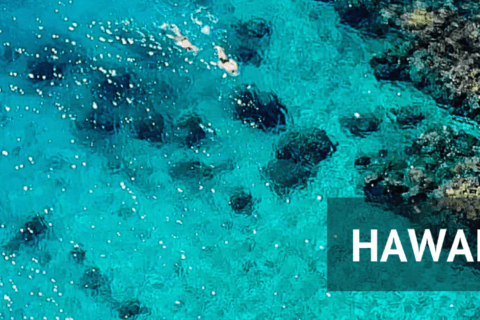 We cover all the possibilities in our Miami transportation guide. Your adventure begins at Miami International Airport (MIA), which has risen up the ranks of the United States’ most-busy airports. While it is positioned at 10th in the world for total passengers, it is second in the U.S. for international traffic. The airport, which Pan American Airlines built in 1928, is not an easy one to navigate, and it has developed a reputation as being a royal pain in the rear because of its confusing terminal layout and time-consuming check-in and security process. This is especially true for international travellers who must get through immigration and customs. The airport’s overall rating on Skytrax is “2 out of 10” because of its poor design and horrid queuing. As you leave MIA, there is a Bank of America near the airport exit that has an ATM and also serves as a place to exchange money for international travellers. In addition, you can obtain visitor information from 6 a.m. to 10 p.m. at the Miami International Airport Visitor Center on the second level of Terminal E.
MIA is six miles west of downtown Miami and 10 miles from the shoreline, so once you get through customs, you will be in your hotel in less than 30 minutes, in most cases. A less congested airport with lower-cost airlines is Fort Lauderdale International Airport (FLL), which is actually closer to North Miami than MIA, and a 45-minute drive to downtown Miami, South Beach, Coconut Grove, and Coral Gables. Well, Worth Checking out for domestic travellers, but service here from abroad is minimal. If you are Staying in Miami Beach and have little Desire to leave the area then really getting to and from the airport is your only real issue. There is a lot to see and do in South Beach and really it’s small enough that most of the time you can just walk. With maybe the odd taxi on nights out. However, it seems a bit of a waste with so much on offer in the wider area. With this in mind, we definitely suggest getting out and exploring further afield than the beach area and for this, you are going to need more than your own two feet! The Miami International Rental Car Center has 6,500 rentals available from all of the major car rental companies, which you can get to by train from the airport’s terminals. However, there are also smaller operations with locations nearby, so do your homework in advance to get the best possible rates. Unless you are satisfied with staying in South Beach and never leaving its confines, it is best to rent a car. While there are other options to get around, the most convenient, and really, the most cost-effective form of transportation is a rental. There are many fine restaurants and interesting attractions to see, but they are spread across the area, so if you plan to explore all that South Florida has to offer, rent a ride. Miami is one of the CHEAPEST places to rent a car, and it is easy to find the perfect economy vehicle for $150 a week, or you can get something sportier—maybe a convertible to fully immerse yourself in the surroundings and do Miami in style—at a price of $300-$400 for a seven-day rental. 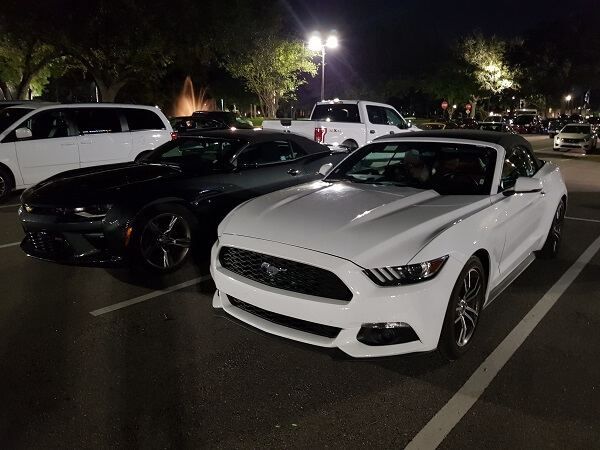 All of the major rental car companies are available in Miami, including Alamo, Avis, Budget, Dollar, Hertz, National, Thrifty, and Enterprise. Cruising down Ocean Drive with the Top Down! We are big fans of rentalcars.com. Mainly as they tend to be the cheapest but also the FREE cancellation really helps with trip flexibility. They also have good fuel and insurance policies included. If you rent a car, something that we found surprising while travelling about Miami is that you make frequent drives across drawbridges that allow sailing vessels to pass through the causeways and even through downtown. Some of the bridges open every 30 minutes to allow passage through the canals and bays that outline the city. Be prepared for delays, but we never waited longer than 10 minutes. The BIG Downside to Renting a Car in Miami Is Parking. While there is plenty, it’s not Cheap. Especially in South Beach. With a high number of hotels and restaurants there is little space left for parking and what there is, comes at a premium. Parking rates vary depending on the neighbourhood where you park your car and how long you plan to stay there. For example, South Beach charges around $4 an hour, while on other beaches to the north, the fee runs about $1 an hour. In other words, expect to pay $1-$4 per hour, with some parking garages charging a flat fee of $15-30 a day. With most parking options, whether in a lot or on the street, you can pay through a phone app, while a few lots only accept cash. Parking tickets start at $18 for an expired meter, so make sure that you do not lose track of time. The City of Miami Beach manages parking in South Beach and its surrounding neighbourhoods, and with 10,000 parking meters, 66 parking lots, and 10 parking garages, you will always find a spot. However, be careful in the neighbourhoods because many of the surrounding streets only allow residential parking, so a resident permit is required. When you visit Miami use parkme.com, which shows a list of available parking spots in the city, as well as the cost of the spot. Finally, valet parking is available at many restaurants and other attractions, but the fee is $10-$20, plus a tip for the valet. Depending on how long you plan to stay, this could provide an option to finding a parking spot and keeping track of your time. Most Hotels will offer Valet Parking too, But expect to pay $60 and upwards! Overnight Parking can be found a lot cheaper in the Public Parking lots ($20 a day) But the issue here is you pay as you leave. Meaning you cannot come and go as you please without paying multiple times. So this is only cost effective if you are leaving the car there…Which kind of negates the purpose of having a car? If you do not plan to get outside of the area where you are staying in Miami, taking the occasional taxi is a decent option. From the airport, taxis line up outside of Miami International Airport’s arrivals terminal in front of a dispatcher’s desk. Most cabs use a meter to calculate your fee, and some charge a flat rate for travel to popular destinations. For example, a typical flat fee from the airport to downtown Miami is $25, and to South Beach, you should pay around $35. Tipping the driver is standard, and should be around 15% if you are travelling light, but be considerate if you have many people in your party and numerous bags to tow. Metered rides start at about $2.50 for the first one-sixth of a mile and $2.40 for each additional mile, as well as $1 per person surcharge. Yellow Cab and Central Cab are your best options for standard rates. Uber and Lyft offer more affordable rates than taxicabs, and from our experience, the drivers are nicer and the cars are cleaner. Presumably, this is because customers rate the drivers at the end of the trip, and drivers must maintain a certain rating in order to continue working for these rideshare service companies. Once you download the Uber or Lyft app, both rideshare applications provide an estimated trip cost before you actually hire a driver, so there are never any surprises at the end of the trip, which happens all too often in a cab. Furthermore, while you can tip drivers, it is not a requirement, and you can make the decision to tip, or not, after the trip is complete, because you can add it to your overall fee once you arrive at your destination. For a basic UberX trip in Miami, there is a 95 cents base fee, plus 13 cents per minute and 85 cents per mile. The minimum fare is $5. Lyft rates are similar. As you can see, the fee is much cheaper than hiring a taxi; in fact, you can expect to pay about half of what a taxicab would charge you and you normally receive better service in the end. For example, an Uber fare from the Miami International Airport to South Beach starts at $18, and would only change if there were unexpected delays because of heavier-than-normal traffic, while, as mentioned above, a cab would cost around $35. Tourists can also grab a bike from a bike-share stand in Miami Beach and Surfside for $24 a day or $4 for 30 minutes. It is a great option for travelling up and down the numerous boardwalks, and even the sand, as it is normally tightly packed. Getting out of the Miami International Airport is easy using the SuperShuttle. The vans operate 24 hours a day and accept credit cards so that you never have to worry about being stranded at the airport. The shuttle will take you anywhere inside of Miami-Dade County for a price that runs $15-$40 per person. While a shuttle ride from the airport can take a while because it makes numerous stops to drop off other passengers, you will save money over a taxi if you are travelling by yourself, and the rate would be about the same as a taxi if you were with one other person. Another option from the airport is a limo or a private car service. Limousines circle the arrival area looking for customers, and the rate for a limo or private car service is $110-$130 to get you to downtown or to South Beach. This cost isn’t too high if you are travelling with a large group of people and are splitting the fee. Private car service companies in Miami include Aventura Worldwide Transportation and Limo Miami. 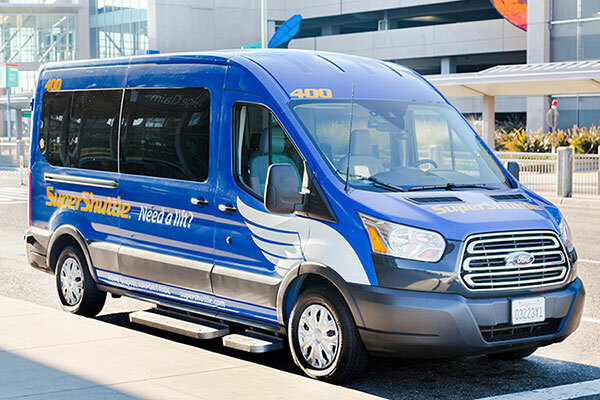 It is unusual for Miami hotels to provide free shuttle service from the airport, but there are some exceptions for hotels that are close to the airport, such as Comfort Suites Miami Airport, Days Inn Miami Airport North, La Quinta Inn & Suites Airport East, and Red Roof Plus Miami Airport. 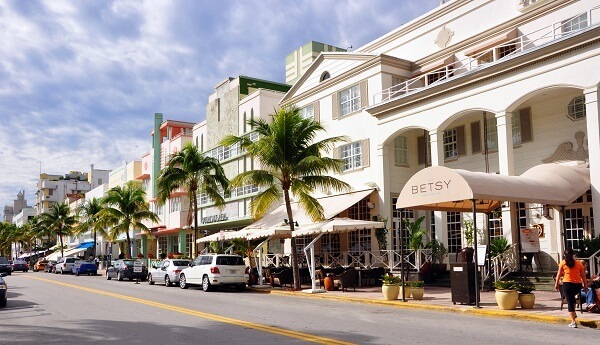 In addition, Hotel Leamington in downtown Miami, Best Miami Hotel near Coral Gables, Runway Inn, and Holiday Inn Miami-International Airport offer free shuttle service to the airport as well as other spots around Miami. This is occasionally included as part of the Resort fee and is one of the rare useful things that resort fee’s include. In every city we visit, we give the public transit a shot. we want to support the communities we visit, travel in an environmentally-friendly way, and to us, it is interesting to see the real people of a city and the streets from their perspective, through the lens of a bus or train window. However, our worst experience with public transportation has been in Miami—the system is apathetic and undependable. For the life of me, we cannot figure out why public transportation in Florida is such a mess. In 2017, 116.5 million tourists visited Florida, and most of them visited Orlando and Miami. In each city, the public transportation is cumbersome. Anyway, there are two rails that the Metro-Dade Transit Agency operates, and the two lines run jointly. One line, Metrorail covers 25 miles spread across 23 stations between the southern suburbs and downtown Miami. The locals, sadly, call it “MetroFAIL” because they don’t find it to be very useful, but at $2.25 a ride during its operating hours of 5 a.m. to midnight, you can save a ton of dough. If you stay in Coral Gables or Coconut Grove, you can take a bike or car to a nearby train station and ride the rail into downtown. The second line, Metromover, is a 4.5-mile elevated rail line that circles downtown and connects with Metrorail at the Government Center stop. Whether or not you like public transportation, the two lines at least provide an interesting view because the train glides on a suspended rail above the streets of the city, allowing you to see angles of Miami that cannot be seen from ground level. 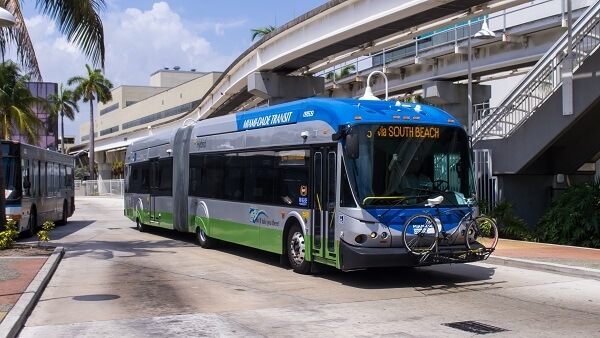 In South Beach, there is a more reliable bus route from South Pointe to Collins Park, at 21st and Park Avenue, with buses running every 10-20 minutes from Monday-Saturday, from 8:40 a.m. to 12:30 a.m., and on Sundays from 11 a.m. to 12.30 a.m. But really Most places in South Beach are close enough you can just walk. Or get a Taxi / Uber if you are dressed up for the evening. From the airport, there is only one downtown bus per hour, and we found connections to be unreliable. It took 90 minutes to get from the airport to South Beach. I don’t mind these trips because I truly am happy to people watch, but everyone else who was travelling from the airport at the same time as us was frustrated and confused. The price is right, though. It cost us $2.25 to get to downtown Miami from the airport and an additional 50 cents to transfer to get to our final destination. There is also the Airport-Beach Flyer, which takes travellers on a 30-minute, direct route from the airport to South Beach for $2.35. Pretty good! We, unfortunately, found this out on our way out of Miami. Another Option for getting around is the Tourist and Sightseeing Buses. These are not particularly fantastic Travel options. However, they are pretty fun in themselves so If you see the Journey as the destination then they are pretty good. The Big Bus services quite a few of the main tourist attractions in the City and the Elevated view you get from the top deck is especially attractive in Miami as a lot of the roads and bridges have high concrete barriers so the view from ground level could be better. From the top deck, you get the full aspect of the city and it’s quite incredible! As we said they are not the best if strict deadlines and timescales have to be met. Queues at the stops can be large and it’s possible you will have to wait for the next bus at very busy periods. But use them to get to one or two attractions as part of a fun day sightseeing and they are pretty fantastic! As a bonus, they are normally included on the different Attractions Passes available for the Miami. 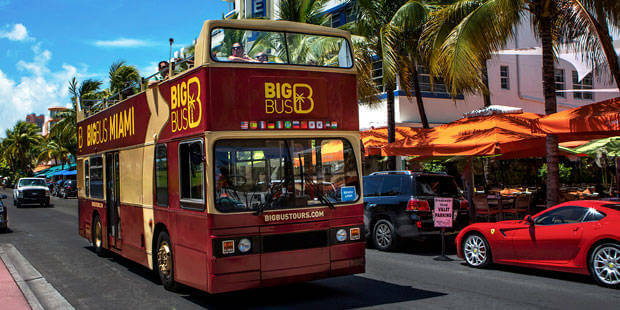 A full day Big Bus Sightseeing is included on the Go Miami Card and the Miami Sightseeing Pass. These include Both Beach and City Loops. Miami and its hot spots are spread out widely, and it isn’t really a great place for walking or biking traffic if you want to get out and stay busy. Therefore, if you can handle longer trips and confusing connections, you will save a lot of money in the end if you use public transportation. However, if you are not into public transit regardless of the cost savings Or just don’t want to spend a large chunk of your trip stood at a bus stop, you are sure to save money and increase convenience by renting a car instead of spending money on costly taxi and ride-share fares. In fact, the cost to rent a car for a day is about the same as one trip by taxi from the Miami International Airport to downtown Miami. 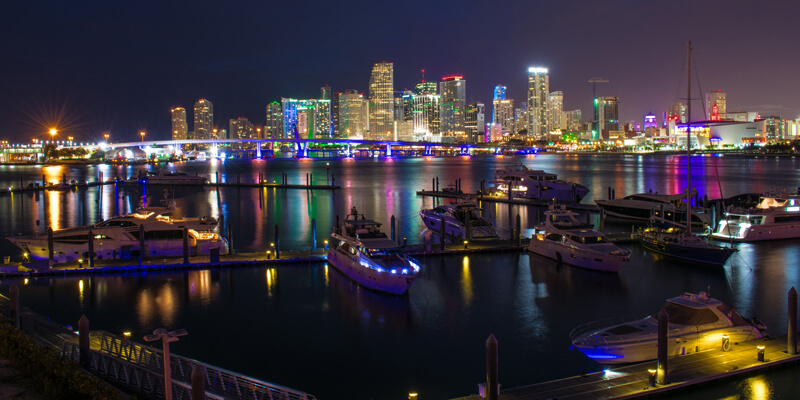 Miami is a great city to explore, and the transportation is a lot cheaper than most metropolitan cities, so any way you travel, you are sure to have fun and not blow your travel budget. How do you get about Miami? Have you Tried the Public Transport? Do you hire a car or just rely on Uber’s and Cabs? Let us know in the comments below or let us know if you have any questions Or if you want to suggestions on getting to any specific points in the City. Next Post:What is the Weather Like in Miami Florida and What Should You Pack? – Our Miami Weather Guide!